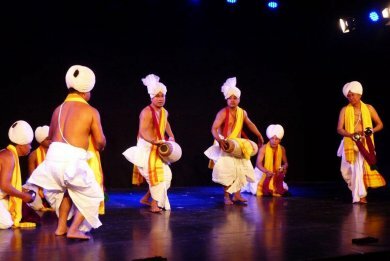 Sangeet Natak Akademi organized the SNA Awardees' Festival at Meghdoot Theatre, Delhi, from 18th till 21st January. Generally once the President of India gives the date for award ceremony, SNA books various venues well in advance to mount the awardees festival of music, dance, drama, puppetry, folk dance and music, and also of other related arts. This time since there was a delay, the Kamani Hall was not available, so SNA had to accommodate the main performances at Meghdoot 3 theatre. I missed the first day performances of Kathak by Jitendra Maharaj, Kathakali by Kalamandalam Ramachandran Unnithan and Manipuri by Maisnam Kamini Kumar. I also missed performance of Yakshagana as it clashed with another performance. But next day I could see five major performances by the awardees at Meghdoot theatre. It seemed a marathon event as it started at 5pm and concluded by 10pm. One had to go to the theatre by 4.30pm to get a good seat as the crowds were swelling on account of many disciples of the awardees.